The United States Capitol Building is located in a 58-acre park originally landscaped by Frederick Law Olmsted in 1874. Today, the Grounds cover more than 270 acres. It was named an accredited arboretum in 2017. Find out more about the AOC team that works in the Capitol Grounds and Arboretum jurisdiction. Originally a wooded wilderness, the U.S. Capitol Grounds now provide a park-like setting for the nation's Capitol Building, offering a picturesque counterpoint to the building's formal architecture. 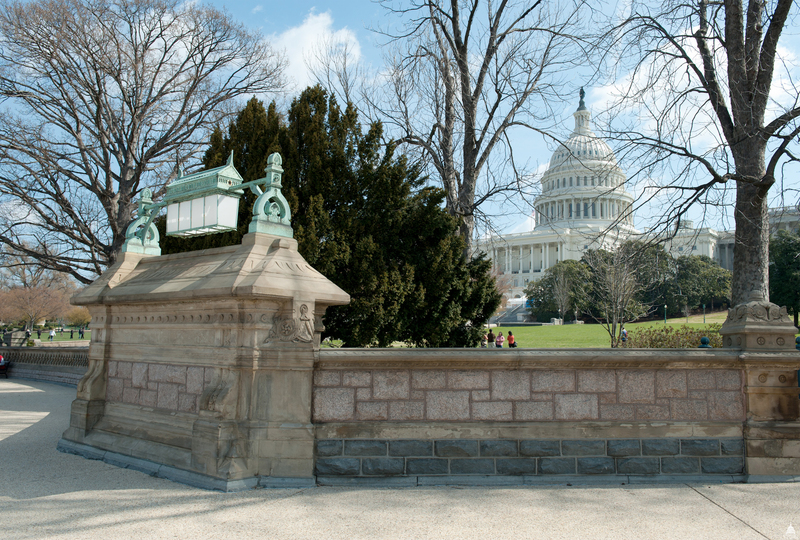 The grounds immediately surrounding the U.S. Capitol are bordered by a stone wall and cover an area of 58.8 acres. It's boundaries are Independence Avenue on the south, Constitution Avenue on the north, First Street NE/SE on the east, and First Street NW/SW on the west. Over 100 varieties of trees and bushes are planted around the U.S. Capitol, and thousands of flowers are used in seasonal displays. In contrast to the building's straight, neoclassical lines, most of the walkways in the grounds are curved. Benches along the paths offer pleasant spots for visitors to appreciate the building, its landscape and the surrounding areas, most notably the National Mall to the west. The grounds were designed by Frederick Law Olmsted (1822-1903), who planned the expansion and landscaping of the area that was performed from 1874 to 1892. Olmsted, who also designed New York's Central Park, is considered the greatest American landscape architect of his day. He was a pioneer in the development of public parks in America, and many of his designs were influenced by his studies of European parks, gardens and estates. In describing his plan for the Capitol Grounds, Olmsted noted that "the ground is in design part of the U.S. Capitol, but in all respects subsidiary to the central structure." Therefore, he was careful not to group trees or other landscape features in any way that would distract the viewer from the U.S. Capitol Building. The use of sculpture and other ornamentation has also been kept to a minimum. Many of the trees on the Capitol Grounds have historic or memorial associations. A number commemorate members of Congress and other notable citizens, national organizations and special events. In addition, more than 30 states have made symbolic gifts of their state trees to the Capitol Grounds. Many of the trees on the grounds bear plaques that identify their species and their historic significance. The eastern part of the grounds contains the greatest number of historic and commemorative trees. At the East Capitol Street entrance to the Capitol Plaza are two large rectangular stone fountains. The bottom levels now contain plantings, but at times in the past they have been used to catch the spillover from the fountains. At other times, both levels have held plantings. Six massive red granite lamp piers topped with light fixtures in wrought-iron cages and 16 smaller bronze light fixtures line the paved plaza. Seats are placed at intervals along the sidewalks. Three sets of benches are enclosed with wrought-iron railings and grilles; the roofed bench was originally a shelter for streetcar passengers. The northern part of the grounds offers a shaded walk among trees, flowers and shrubbery. A small, hexagonal brick structure, named the Summerhouse, is found in the north-west corner of the grounds. This structure contains shaded benches, a central ornamental fountain and three public drinking fountains. In a small grotto on the eastern side of the Summerhouse, a stream of water flows and splashes over rocks to create a pleasing sound and cool the summer breezes. The location of the U.S. Capitol Building was selected by the designer of the federal city, Pierre L'Enfant, and approved by President George Washington during a visit to the site in 1791. L'Enfant famously wrote that he thought the elevated position selected for the building was like "a pedestal waiting for a monument." That pedestal is today known as "Capitol Hill." The land on which the U.S. Capitol stands was first occupied by the Manahoacs and the Monacans, who were subtribes of the Algonquin Indians. Early settlers reported that these tribes occasionally held councils not far from the foot of the hill. This land eventually became a part of Cerne Abbey Manor, and at the time of its acquisition by the federal government it was owned by Daniel Carroll of Duddington. The "Residence Act" of 1790 provided that the federal government should be established in a permanent location by the year 1800. In early March 1791, the Commissioners of the City of Washington, who had been appointed by President George Washington, selected the French engineer Pierre Charles L'Enfant to plan the new federal city. L'Enfant decided to locate the U.S. Capitol at the elevated east end of the Mall (on what was then called Jenkins' Hill); he described the site as "a pedestal waiting for a monument." At this time the site of the U.S. Capitol was a relative wilderness partly overgrown with scrub oak. Oliver Wolcott, a signer of the Declaration of Independence, described the soil as an "exceedingly stiff clay, becoming dust in dry and mortar in rainy weather." A muddy creek with swampy borders flowed at the base of the hill, and an alder swamp bordered by tall woods occupied the place where the United States Botanic Garden now stands. The city's inhabitants, like L'Enfant and Washington, expected that the capital would grow to the east, leaving the Capitol Building and the White House essentially on its outskirts. For some years the land around the U.S.Capitol was regarded as a common, crossed by roads in several directions and intended to be left as an open area. In 1825, a plan was devised for imposing order on the Capitol Grounds and it was carried out for almost 15 years. The plan divided the area into flat, rectangular grassy areas bordered by trees, flowerbeds and gravel walks. The growth of the trees, however, soon deprived the other plantings of nourishment, and the design became increasingly difficult to maintain in light of sporadic and small appropriations. John Foy, who had charge of the grounds during most of this period, was "superseded for political reasons," and the area was then maintained with little care or forethought. Many rapidly growing but short-lived trees were introduced and soon depleted the soil; a lack of proper pruning and thinning left the majority of the area's vegetation ill-grown, feeble or dead. Virtually all was removed by the early 1870s, either to make way for building operations during Thomas U. Walter's enlargement of the U.S. Capitol or as required by changes in grading to accommodate the new work on the building or the alterations to surrounding streets. The mid-19th-century extension of the U.S. Capitol, in which the House and Senate wings and the new dome were added, required also that the Capitol Grounds be enlarged and, in 1874, Frederick Law Olmsted was commissioned to plan and oversee the project. As noted above, Olmsted was determined that the grounds should complement the building. In addition, he addressed an architectural problem that had persisted for some years: from the west the direction in which the city was clearly growing the earthen terraces at the building's base made it seem inadequately supported at the top of the hill. The solution, Olmsted believed, was to construct marble terraces on the north, west and south sides of the building, thereby causing it to "gain greatly in the supreme qualities of stability, endurance, and repose." He submitted his design for these features in 1875, and after extensive study it was approved. Work on the grounds began in 1874, concentrating first on the east side and then progressing to the west, north and south sides in 1875. First, the ground was reduced in elevation. Almost 300,000 cubic yards of earth and other material were eventually removed, and over 200 trees were transplanted. New sewer, gas and water systems were installed. The soil was then enriched with fertilizers to provide a suitable growth medium for new plantings. Paths and roadways were graded and their foundations were laid. By 1876, gas and water service was completed for the entire grounds, and electrical lamp-lighting apparatuses had been installed. Stables and workshops had been removed from the northwest and southwest corners. A streetcar system north and south of the west grounds had been relocated farther from the Capitol, and ornamental shelters were in place at the north and south car-track termini. The granite and bronze lamp piers and ornamental bronze lamps for the east plaza area were completed. Work accelerated in 1877. By this time, according to Olmsted's report, "altogether 7,837 plants and trees [had] been set out." However, not all had survived: hundreds were stolen or destroyed by vandals, and, as Olmsted explained, "a large number of cattle [had] been caught trespassing." Other work met with less difficulty. Foot-walks were laid with artificial stone, a mixture of cement and sand, and approaches were paved with concrete. An ornamental iron trellis had been installed on the northern east-side walk, and another was under way on the southern walk. An underground air duct for ventilating the Hall of the House was laid to a temporary opening in the west side of the hill. The 1878 appointment of watchmen to patrol the grounds was quite effective in preventing further vandalism, allowing the lawns to be completed and much shrubbery to be added. Also in that year, the roads throughout the grounds were paved. Most of the work required on the east side of the grounds was completed by 1879, and effort thus shifted largely to the west side. The Pennsylvania Avenue approach was virtually finished, and work on the Maryland Avenue approach had begun. The stone walls on the west side of the grounds were almost finished, and the red granite lamp piers were placed at the eastward entrance from Pennsylvania Avenue. In the years 1880-82, many features of the grounds were completed. These included the walls and coping around the entire perimeter, the approaches and entrances, the tower for the House air shaft and the Summerhouse. Work on the terraces began in 1882, and most work from this point until 1892 was concentrated on these structures. In 1885, Olmsted retired from superintendency of the terrace project; he continued to direct the work on the grounds until 1889. Landscaping work was performed to adapt the surrounding areas to the new construction, grading the ground and planting shrubs at the bases of the walls, as the progress of the masonry work allowed. Some trees and other types of vegetation were removed, either because they had decayed or as part of a careful thinning-out process. In 1886, Olmsted recommended that the Senate side of the Capitol be supplied with fresh air through a duct and tower similar to those on the House side. This project was completed in 1889-90. In 1888, the wrought-iron lamp frames and railings were placed at the Maryland Avenue entrance, making it the last to be completed. In 1892, the streetcar track that had extended into grounds from Independence Avenue was removed. In the last years of the 19th century, work on the grounds consisted chiefly of maintenance and repairs as needed. Trees, lawns and plantings were tended, pruned and thinned to allow their best growth. This work was quite successful: by 1894, the grounds were so deeply shaded by trees and shrubs that Architect of the Capitol Edward Clark recommended an all-night patrol by watchmen to ensure public safety. A hurricane in September 1896 damaged or destroyed a number of trees, requiring extensive removals in the following year. Also in 1897, electric lighting replaced gas lighting in the grounds. Between 1910 and 1935, 61.4 acres north of Constitution Avenue was added to the grounds. Approximately 100 acres was added in subsequent years, bringing the total area to 274 acres. In 1981, the Architect of the Capitol developed the Master Plan for future development of the U.S. Capitol grounds and related areas. Since 1983, increased security measures have been put into effect, including the installation of barriers at vehicular entrances. However, the area still functions in many ways as a public park, and visitors are welcome to use the walks to tour the grounds. Demonstrations and ceremonies are often held on the grounds. During the summer, many high-school bands perform in front of the Capitol, and a series of evening concerts by the bands of the armed forces is offered free of charge on the East Front plaza. On various holidays, concerts by the National Symphony Orchestra are held on the west front lawn.